When a friend asked me what my favorite food was, I didn’t hesitate. “Salsa!” I replied. I like chips, too, but mainly as a conduit to salsa fresca: tomatoes, onion, a pepper, cilantro, and lime juice. I love the chunky and the tart, with just the right heat. I like my salsa on the medium to mild side, too much heat and my taste buds are overwhelmed; too little heat and the salsa remains only a sidebar. Just the right amount, and I want to add it to everything, the burritos, the tacos, the enchilada. I like the fresh, California-style Mexican, and I love fish tacos. In college, I traveled to Ensenada with a couple of friends where we ate fish tacos for a quarter from street vendors. Fried fish, salsa fresca, sliced cabbage, mayo and a little lime juice all within a corn tortilla. The best. Now an East Coast transplant, I’m always searching for the perfect Mexican place. I’ve eaten at several in New England over the years, but no matter how hard I try, my favorite Mexican restaurants remain in California, and two of them are located in the Bay Area: Guaymas and Joe’s Taco Lounge. Guaymas is the fancier of the two. Located on Main Street in Tiburon, Guaymas is perched on the Bay. You can sit outside among the seagulls and the sail boats or inside where papel picado banners (those brightly colored paper cutouts) decorate the room. I ate lunch at Guaymas after the Loma Prieta Earthquake – feeling safe and lucky in barely touched Tiburon, looking across the Bay at crumpled and warped San Francisco. 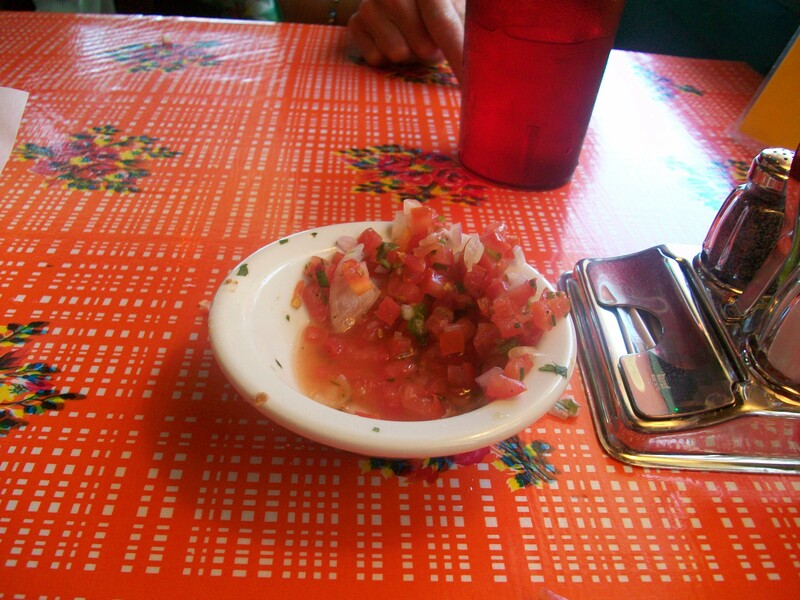 At Guaymas, they serve a variety of salsas. Try the Ceviche de Pescado, the Poblano en Nogado, or the Tamales Platano. 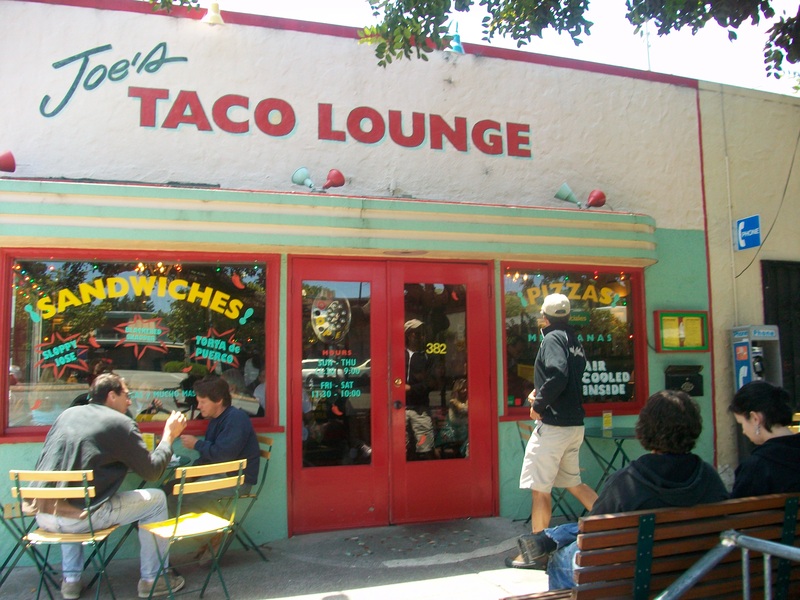 Not far from Guaymas, you can find Joe’s Taco Lounge in the small town of Mill Valley (identified as one of the best small towns in Smithonian Magazine’s recent article). Small, noisy, and colorful, you have to get there early for a table or be prepared to wait. Here the only view is of colorful hot sauces lining the wall and the bar in the center of this tiny restaurant. I’ve heard the burritos are amazing, but I can’t get beyond the fish tacos, and I always ask for more salsa. Photos on this post by Erica on trip taken in May 2009. I can sympathize with you on your search for good mexican food in New England! Until recently, we had to drive 30 minutes to the nearest Taco Bell! And actually, I prefer the portion size and freshness of Taco Bell to the large goopy concoctions served at nicer establishments. The new place Bueno y Sano in Acton is quite good for fast mexican. You can even get tofu in the burritos. I love your photos. Such great visuals to get the “flavor” of the places! I was disappointed that Bueno y Sano’s tacos are served in flour tortillas (not corn) but will try them again. I’ll write a future post on my favorite local Mexican restaurants. What a wonderful potpourri of adventures — I never know where you’ll take me on these delightful sojourns! One caveat — Snapshots? I don’t think so! The photos are always striking and well done. Todays pix? Terrifico! Way to go, Erica! Thanks, Heidi. Look for more stories of my adventures over the last few years in future posts.